Based in Nigeria, 15 year old Kambili is desperately trying to keep her head above water, alternating between tip-toeing around her father and trying her hardest to make him proud (and keep him happy). Kambili is different to most girls her age in Nigeria, and even her cousin thinks that she is a stuck up snob with everything she can wish for from her big-shot father. The truth of the matter is, Kambili is just plain terrified, and her family life is not what its cracked up to be. Whilst the whole community is in awe of her father and his godly, almost angelic ways of helping out the community, Kambili, her brother Jaja and her mother live every day in fear that they might upset him; just putting just one foot wrong in the eyes of their father (and husband), Eugine (or papa as Kambili and Jaja call him!) causes him to erupt with such force that they are left shaken for days. All this starts to change when they are sent to the Aunt Ifeoma and discover what their life should be like – noisy, loving and carefree. Knowing how life should be like, how long will it be before one of them cracks? 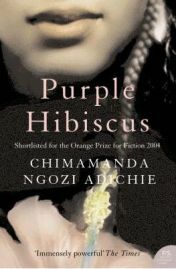 “Purple Hibiscus” is a strange book to describe, the story as I have mentioned is about one family and all the secrets they hide. It is quite a subtly disturbing tale about abuse and silent terror in a household that is made even more difficult to comprehend when the rest of society thinks that the man who terrifies his family so much is a saint when it comes to life outside his home. The subtleness of this tale is really quite amazing. The young narrator of this story is a very loving and easily likeable Kambili. Kambili is the perfect narrator of this story, the youngest in her family, we see her constantly torn between love for her father and absoloute terror that she might do something to upset him. Chimamanda Ngozi Adichie, does an impressive job of building on Kambili’s quiet, shy personality as well as showing how awful her home life is. Nothing is over the top in her writing; just by Kambilis thoughts, we can see how awful her home situation is, even if Kambili herself does not yet realise it; for a majority of the book, she remains obvlious to the fact that her fathers treatment of them all is not normal and that in fact she is to blame for her fathers rages. Without revealing the story, Kambili’s fathers moods are rather far ranging. He is man of power in their community, a God fearing man who is well liked and respected for his moral values and for his very generous nature when it came to giving gifts and money to the poor. On the surface, he looks after his family, only wants the best for them and will provide them with everything they need to get along in life. Underneath however, is where the story – and the writing – gets much more complex. His need for complete control over his children and wife is at the complete extreme, everything is on schedule and the family has to atone for every tiny mistake they ever made which made me constantly wonder what had happened to make him this way. Throughout the book, things are revealed about Eugenes treatment of his family that goes beyond mere disappointment and again, as they are told from Kambilis quiet and naive voice, these events become even more powerful and shocking to the reader. Of course, Eugene does become a figure of hate throughout the book despite his many good qualities. I liked the way in which the author mixed this up so at times the reader almost feels that Eugene really is a good person; Kamibli often talks of how proud she is of her father when others praise him and when he has been particularly violent towards his family, he is always shown afterwards as sad, (although never remorseful). What is really interesting about this story is the way that their crumbling family is reflected perfectly by the disintergration of their world as they know it. A military coup is making it difficult for anyone in the country to have any kind of freedom of speech and ironically, it is Eugene who is one of the men standing up to this dangerous regime that is keeping the country downtrodden, clearly he is unable to see that he has been giving similar treatment to his family. As this story is told by Kambili, the staggering effect that this military group are having on the country almost loses its impact as her world is completely consumed with keeping her dad happy at all times and at all costs which shows you how much power he wields over his family, and also is a testament to the powerful way in which Kambili has chosen to reveal her story. It isn’t all sadness and opression in this book, there are some humorous moments and some very colourful characters that make this a joy to read. There is some tentative moments of romance when Kambili stays with her aunt and her cousins, all of whom are larger than life and seem full of happiness despite their poor surroundings. The whole book in fact was just beautifully written and a joy to read. Even if the subject matter is a little on the difficult side, the way in which things and events are described makes it such a joy to read. The descriptions are perfect and so wonderful to read about and I loved reading her thought processes as they were so vivid and superbly put. This is definitely the book for you if you are after a hard hitting story that has plenty of sad as well as happy moments. It is extremely well written and very well thought out, describing the terror of a family and the celebration of freedom – in many parts of their lives. It is also a book that looks at the hypocrisy of religion and the forceful power of the Western World and culture onto a country like Nigeria. Despite being a Westerner, it is very easy to side with the traditional characters in the book rather than Eugene’s Western ways and influence. All in all this book covers some amazing subjects with ease. One I would definitely recommend. No Comments on "Purple Hibiscus"